The Neverfail Channel is the key communications link between the Primary and Secondary servers and allows for replication of updates from the active server to the passive server. As such, the status of the channel is important and knowing how to check it will assist you in maintaining your Neverfail system and troubleshooting potential problems. Checking the status of the Neverfail Channel should be a routine maintenance task and helps identify potential problems in the event of a failover. For an overview of channel status, open the Neverfail Heartbeat Management Client, select the System button , and then 'Status & Control' tab. 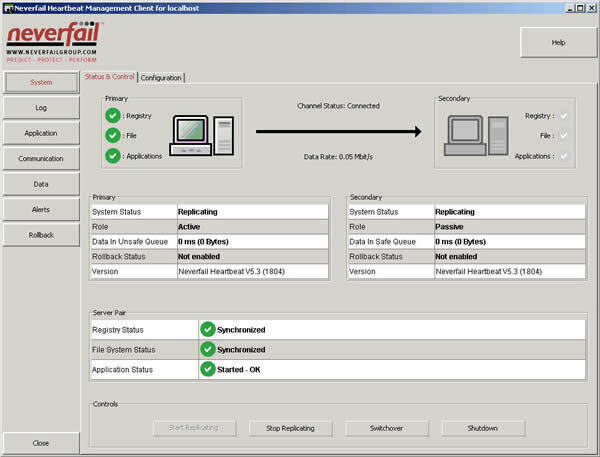 The graphic on the screen indicates whether the channel is connected between the active and passive servers and provides an overview of pair status. 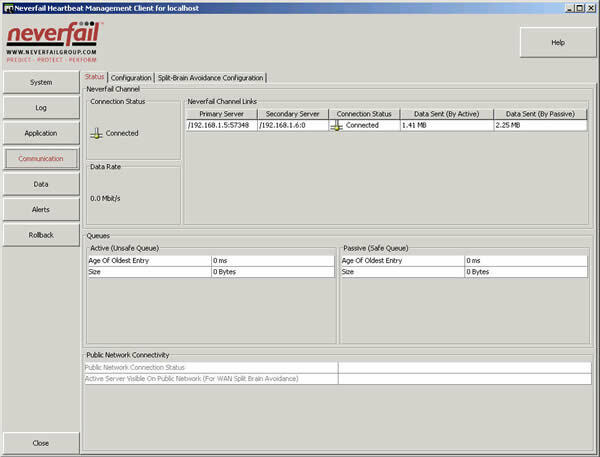 For a more detailed view of the channel status, open the Neverfail Heartbeat Management Client, select the Communication button, then select the 'Status' tab. At the top of the screen you will see the status and throughput for each of the links in the Neverfail Channel. You can see the queue size and connection status displayed.